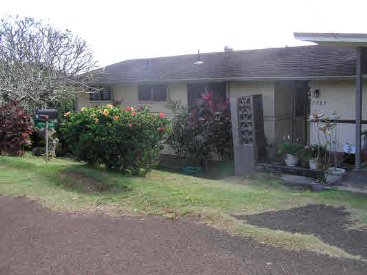 This two bedroom/one bath home is located near the base of Sleeping Giant in the Wailua House Lots subdivision. Enjoy lots of privacy. This sloping lot has peek of ocean views from both of the bedrooms and the living area. Enjoy unobstructed mountain views of Sleeping Giant all around. There is a laundry room downstairs with a shower which is great for working in the yard or coming in from the beach. Enjoy lots of storage under the home. Plans have been approved by the County for expansion of the home to add 300 sq ft, a covered lanai and another bathroom. Tax records say 3 bedrooms, home has 2 bedrooms. This is a short sale.